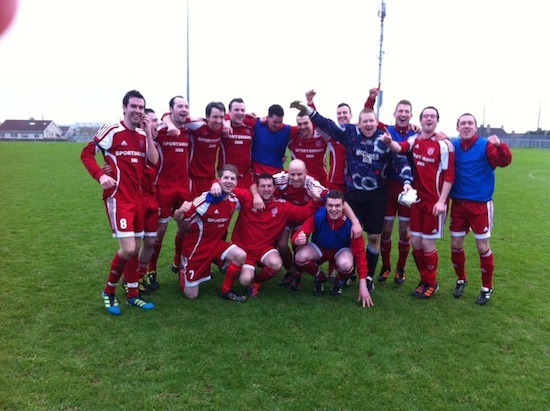 UPDATED: CARDONAGH FC are through to the last eight of the FAI Junior Cup after a long trek to Co Waterford today saw the Inishowen side win on penalties. The Donegal side’s clash away to Tramore Athletic remained goalless – even after extra time. So in the dramatic penalty shoot-out keeper Gerard Crossan was the hero of the day as he saved twice – to give Carn a 4-2 victory! They now have a home draw in the quarter finals against Dublin side Ballymun. Milford United’s hopes of progressing however were washed away in a 6-0 home defeat to Pike Rovers, the current cup holders from Limerick. The Donegal side were 3-0 down at half-time thanks to goals from Colin Enright, Eoin Hanrahan and Conor Kavanagh. David Ryan, Johnny Boyle and Kieran Hamlin hit three more in the second half. “We never really got going against the best side we have ever played against,” said United’s Peter Doherty afterwards.